You May be at Risk to Hidden Exposures in Your Commercial Financing Arrangements. If your company is borrowing money to build or purchase property or to acquire businesses, you may be exposing your balance sheet and/or shareholder equity to unpredictable, negative financial consequences. 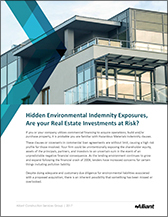 "Hidden Environmental Indemnity Exposures: Are Your Real Estate Investments at Risk?" explores how savvy investors are utilizing pollution insurance in their loan covenants to minimize risk and secure their investment.